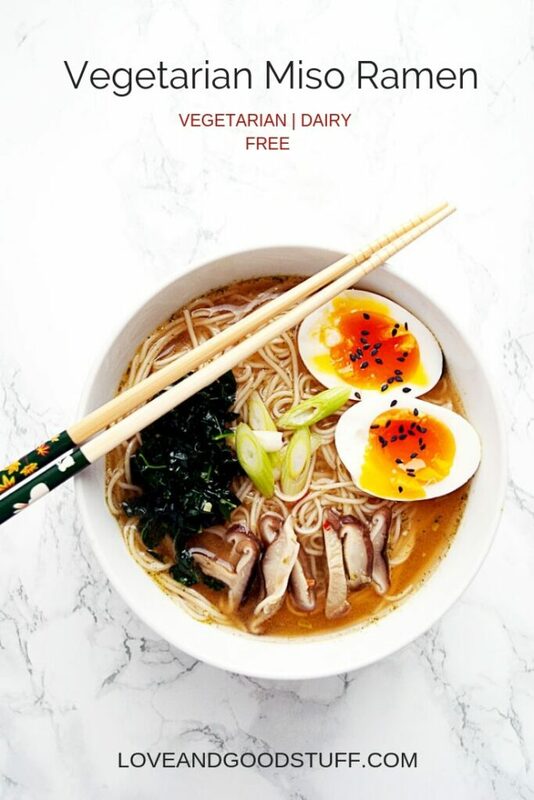 Vegetarian miso ramen is an easy, gut healthy ramen recipe filled with miso, garlic, ginger, shitake mushrooms, kale and a soft boiled egg. Easily adapted to vegan by swapping the egg for tofu, this comforting noodle bowl is ready to eat in 15 minutes. 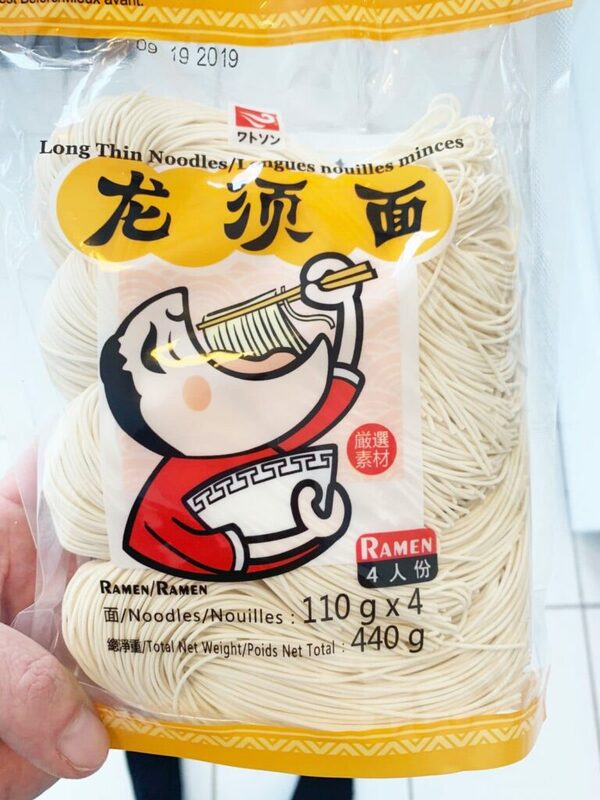 These noodles are definitely a step up from the noodles that come in the instant noodle soup packets, so if you have an Asian grocery nearby I highly suggest giving a look for them – I found them in the dried noodle aisle. They are different from the noodles that come in the instant ramen packs though – you must cook these noodles first before adding them to your soup because they are coated in starch. 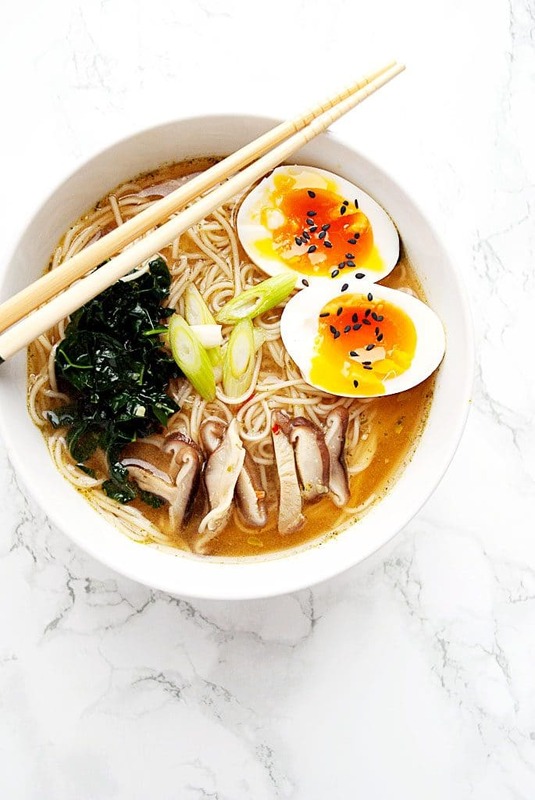 If you can’t find these kinds of noodles, the noodles from an instant ramen packet will be just fine – just throw out the flavour packet that comes with it, and instead of cooking the noodles first before adding them to the soup, you can cook the noodles right in the broth. Fill a medium pot with water and bring it to a boil over medium-high heat. You will use this pot to cook the eggs and pre-cook the noodles if you are using ‘fresh’ noodles like the ones I used for this recipe. While you are waiting for the water to boil, prepare the broth. Put a second medium pot on a burner at heat to medium heat. Add a touch of sesame oil, or other cooking oil, and gently saute the garlic and ginger for about 2 minutes. You want to just heat them up so they begin to release their flavours. 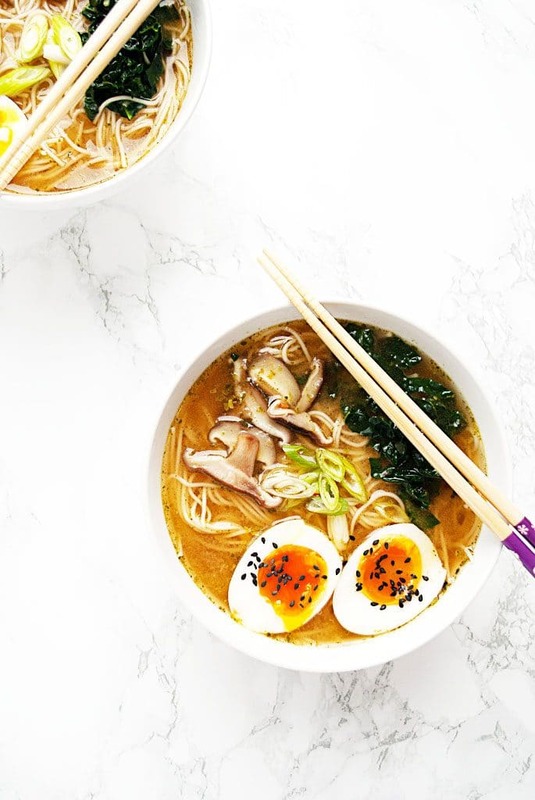 Add your stock to the pot and bring it to a temperature just below boiling – when you add the miso to the broth you want it warm but not boiling – miso is full of gut-healthy probiotics, and adding it to boiling water kills the nutritional benefits. When your first pot of water is boiling, cook the eggs. For the perfect jammy egg, use a spoon to lower each egg into the boiling water dunking it in quickly and pulling it out a couple of times before finally submerging it to cook. This climatizes the egg to the boiling temperature and reduces the shock which keeps the eggshell from cracking. Cook the eggs for 6 and a half minutes, and then place in a bowl of ice water to stop the cooking process and keep the middle soft. If you prefer your eggs completely hard, cook for an extra 30 seconds and skip the ice bath. While your eggs are cooking, put your shredded kale and sliced shitake mushrooms into the stock pot and allow them to cook for 3-4 minutes. Remove the pot from the heat source, then stir in the miso paste. 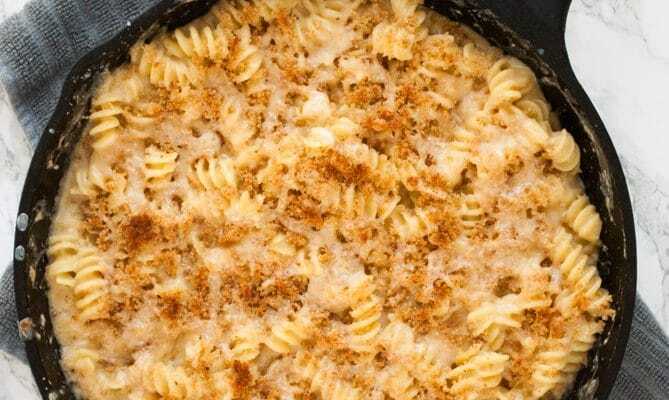 After you have cooked the eggs, put the noodles in the boiling water and cook according to package directions. My noodles had a 1.5 minute cooking time. If you are using noodles from ann instant soup package, skip this step. Strain the cooked noodles, and place them directly into large soup bowls. Ladle the stock over the noodles, add the cook vegetables and a sliced egg and garnish with sliced green onions. Fill a medium pot with water and bring to a boil. You will use this pot to cook both the eggs and the ramen noodles. While waiting for the water to boil, place another pot on the burner over medium heat. Add the sesame oil and saute the ginger and garlic for a minute or two before adding the vegetable stock and tamari. When the pot of water has boiled, add the eggs one at a time using a spoon to slowly lower them into the water. Cook for 6 1/2 minutes for the perfect jammy egg. Remove from the pot using a spoon and place into a bath of cold water and ice to stop the cooking process. While the eggs are cooking, add the sliced mushrooms and kale to the broth pot. Cook for 3-4 minutes. While the vegetables are cooking in the broth, cook your ramen noodles in the pot of boiling water you used to cook the eggs. The directions on my package were to cook for 2 1/2 minutes. Strain the noodles from the water and place into large soup bowls. Bring the broth pot to a temperature just below boiling and remove from heat before stirring in the miso. 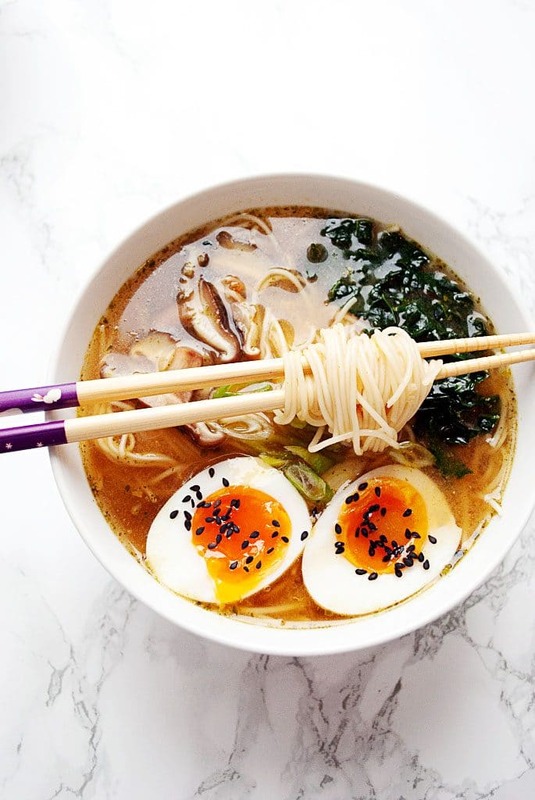 ladle the broth over the noodles then top with the cooked vegetables, a sliced egg, and garnish with green onion. There are few foods I love more than ramen. This healthy recipe looks especially delicious, and I always, always have to have an egg in mine, so it’s perfect! 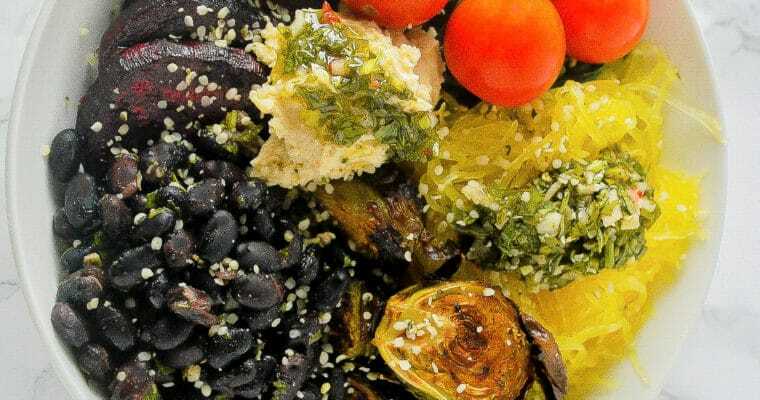 What a wonderful dish for lunch or a lighter dinner. 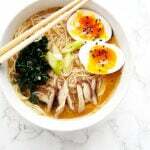 I love the broth and the noodles in this, can’t wait to make it! I’m not vegan but this sure does look good. I absolutely love anything with miso in it, and am also a sucker for noodles. It’s hard to find a delicious vegan or vegetarian ramen in restaurants so I really appreciate this recipe. And thanks for the tip on the noodles, I’m sure they make a big difference.